@NicolasMaduro: “Today the fifth of July, 202 years after the declaration of Independence we have a Bolivarian Fatherland. Let there be no mistake. Long live Bolívar and Chávez!”. July 5 promises to be a day full of heady symbolism and ritual as Venezuela simultaneously celebrates 202 years of independence and commemorates the five months that have past since the death of Hugo Chávez Frias. It also provides another opportunity for Nicolas Maduro to seek to transfer Chávez’s charisma to his own mandate as president. Maduro will preside over a ceremony celebrating military promotions at the Cuartel de la Montaña, where Chávez’s remains lie, before presiding over a civilian military parade in Los Proceres. As we argued previously, all modern nation-states construct forms of civil religion in order to consolidate the loyalty of their citizens. And the “Bolivarian religion” is a phenomenon that dates back at least to the end of the XIX century, well before Chávez´s coming to power (see Luis Castro Leiva’s seminal book). Bolivarianism was used by all Venezuelan governments of the twentieth century as part of their legitimating strategies. Indeed Chávez was immersed in the nationalist rhetoric of the cult of Bolivar and the Independence struggle during his formative years in the Military Academy. But the current government has carried this cult to a higher level, adding the figure of the recently deceased Chávez to the pantheon of national heroes right next to Bolivar himself. Chávez is now routinely referred to as the Comandante Supremo or Comandante Enterno in official the media. 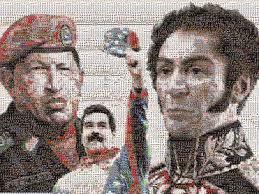 A state television outlet has even run an animated clip in which Chávez meets Simón Bolívar, and other Latina American popular heroes, in the afterlife, confirming his status as a member of the heroic pantheon. Although it was finally decided not to embalm Chávez’s remains, they now rest in the Cuartel de la Montaña which has become a rival to the Panteón Nacional as the sanctuary of Venezuelan Bolivarian religion. Tour guides at the Cuartel correct those who refer to Chavez in the past tense, suggesting he is still with us. President Maduro’s discourse, like Chávez’s before him, permanently seeks to transport the audience to a mythical sacred time of Venezuela’s Nineteenth Century independence struggle, an illo tempore which is constantly reenacted in the present Bolivarian revolution.